Department of Orthopaedics, P.G.I of Swasthiyog Pratishthan Miraj, Maharashtra-416410, India. Introduction: The tibial plateau fractures represent 1–2% of all fractures and approximately 8% of the fractures in elderly. High velocity trauma results in complex tibial plateau injuries with severe soft tissue compromise which is associated with significant morbidity. Despite evolution of treatment in past 50 years, the optimal treatment remains challenging as many patients have unsatisfactory clinical results with significant residual dysfunction and wound complications. The purpose of this study is to evaluate role of staged protocol in the functional outcome of management of complex tibial plateau fractures. Material and methods: 30 fresh cases of bicondylar tibial plateau (Schatzker type V and VI) fractures of both the sexes were included in the study. All cases were subjected to a staged protocol with definitive fixation by dual incision, dual plate technique. Regular follow-up was done at 2,6,12, 24 weeks. Radiological parameters such as medial proximal tibial angle and posterior proximal tibial angle and union time were recorded while functional outcome was evaluated by patient answered oxford knee score. Results: There were 10 cases of Schatzker type V and 20 cases of Schatzker type VI in the study. Average time interval between admission in hospital and definitive surgery was 6.9 ± 3.78 days. Superficial infection was encountered in 5 (16.67%) patients while deep infection was seen in 1 (3.33%) patient. Final functional outcome as evaluated by patients using Oxford Knee Score questionnaire was good to excellent in 83.33 % of cases. Conclusion: Staged management with definitive fixation using dual incision, dual plating technique is an excellent method of treatment of complex bicondylar tibial plateau (Schatzker type V and type VI) fractures in judiciously selected cases. Keywords: Complex bicondylar tibial plateau fracture, Dual incision, soft tissue injury, staged management, Oxford score. The tibial plateau fractures represent 1–2% of all fractures and approximately 8% of the fractures in elderly (1). Schatzker type V and VI are complex tibial plateau fractures usually associated with high energy trauma. These fractures have intricate injury pattern with compromised soft tissue envelope which lead to unpleasant prognosis with significant morbidity. There has been a dramatic evolution in the management of these fractures in the past century. It started with traction and cast bracing to recent arthroscopic assisted internal fixation. Despite availability of numerous modalities, many patients have unsatisfactory clinical results with significant residual dysfunction and wound complications (2-4). Present literature is split regarding choice of optimal modality of treatment. A strategic treatment protocol with minimal functional deficit is the need of the hour. Current treatment options for complex bicondylar tibial plateau fractures consists of using various modalities which include fine wire fixators like Ilizarov circular fixator or Taylor spatial frame, dual column plating and more recently arthroscopically assisted reduction and internal fixation with plating (5-7). Each of these modalities have their pros and cons but are frequently encountered with soft tissue breakdown which further complicates the difficult scenario and increases the infection rates. Therefore, soft tissue requires utmost importance in the management of complex tibial plateau fractures. Staged management of these fractures can address problems of soft tissues and can lower infection rates and complications. Use of two incisions may further reduce soft tissue irritation. This study focuses on evaluating the outcome of staged management of complex bicondylar tibial plateau (Schatzker type V and VI) fractures using dual incisions and dual plates as internal fixation. A prospective study of 30 patients having complex bicondylar tibial plateau fracture was conducted with scientific and ethical committee approval. Inclusion criteria were all patients above 18 years of age with fresh proximal tibia fractures radiologically classified as Schatzker type V or VI fractures having closed or Gustilo Anderson grade I compound injury (Figure 1). Exclusion criteria were pathological fractures, Gustilo Anderson grade II and III injuries, fractures with neurovascular injury, associated ipsilateral limb fractures and patients unfit for surgical intervention. Written informed consent was taken from all patients for the plan of management of the injury and surgery. All the patients were evaluated and stabilized as per Advanced Trauma Life Support guidelines. All included patients were subjected to staged protocol for the study. Initially a knee spanning external fixator was applied to all patients and was followed by a waiting period for soft tissue swelling to subside. During the waiting period, limb was subjected to anti oedema measures such limb elevation, ice packs and enzymes. End of waiting period was marked by the presence of wrinkling of skin in the affected area. Waiting time period was utilized for surgical planning guided by appropriate imaging technique like X-rays and CT scan. All surgeries were performed under spinal anaesthesia on radiolucent table in a standard operating room by an expert surgeon (Figure 2). Medial column was fixed first followed by the lateral column. For medial column, a posteromedial approach was taken. Fracture site was exposed by careful minimal soft tissue dissection. Anatomical reduction was attempted and temporarily fixed with K- wires. Image intensifier was utilized when required during reduction and temporary fixation. Then, a “T” or “L” buttress plate or a locking compression medial proximal tibial plate was used to fix the fragment. Depending on fracture anatomy, plate was placed either posteromedially or anteromedially. Image intensifier was utilized to position the plate below the level of the joint line and the plate was then fixed to the bone with appropriate screws. dissection was done. Lateral meniscus was carefully retracted to visualize lateral tibial condyle. The depressed fragment was then elevated and fixed temporarily with K-wires. 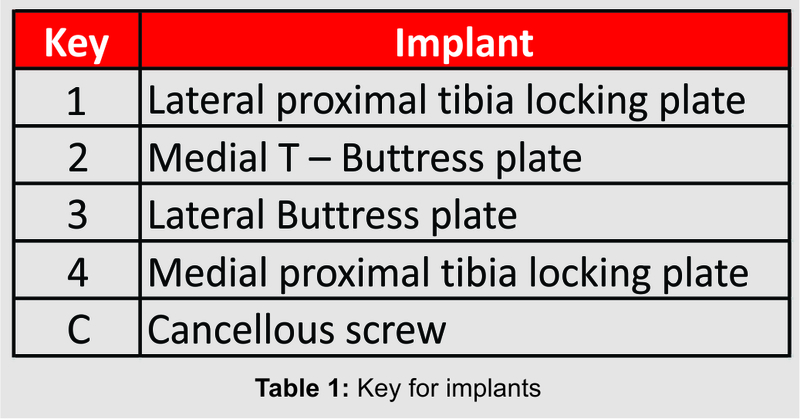 Additional, interfragmentary screws, if required were used to supplement reduction. The fracture reduction was confirmed under image intensifier. After temporary fixation, a lateral tibial locking compression plate or “T” or “L” buttress plate was used to fix the lateral column. Fracture reduction and plate position below the joint line was confirmed under image intensifier. The plate was then fixed to bone with appropriate screws. Care was taken while putting screws from lateral to medial to avoid penetrating concave medial joint surface. Bone grafting, if required was done from ipsilateral or contralateral iliac crest. Wounds were closed under negative suction drain and sterile dressings were applied. Post operatively limb was elevated and regular dressings were done. Appropriate antibiotics were given. Suction drain was removed after 48 hours. Sutures were removed on 14th day if wound margins were healthy. Wound showing any suspicious signs of infection were treated with serial debridement, culture sensitive antibiotic and local antibiotic bead, if needed. During the first post operative week, the patients were started with non weight bearing mobilization, passive range of motion and static quadriceps exercises as per pain tolerance on day one. It was followed by active assisted knee bending and quadriceps exercises by day three, progressing to mobilization using a walking frame without weight-bearing on the operated leg by the end of the week. Hip and ankle range of motion exercises were started subsequently. Partial toe touch weight bearing using walker was started at the end of 6 weeks and full weight bearing at the end of 12 weeks or after clinical and radiological union. Patients were subjected to regular follow up at 2, 6, 12, 24 weeks and more if required. At each follow up, clinical and radiological assessment was done. Radiological outcome evaluation was assessed by parameters i.e. medial proximal tibial angle (MPTA), posterior proximal tibial angle (PPTA) and progression of healing (union; determined by visibility of fracture lines). Clinically, surgical site condition and range of motion was assessed. Complications like surgical site infection, deep infection, knee stiffness, knee instability were recorded. The functional outcome evaluation using Oxford Knee Score questionnaire was done at the end of 24 weeks of follow up. The Data obtained was statistically analyzed using Microsoft Excel and IBM SPSS Statistics software (Version 23). The data was summarized using percentages, mean and standard deviation. Difference in distribution of cases was analyzed using chi square test of goodness of fit. Chi square test of association was used to study association of qualitative data such as fracture type, category of oxford score and range of motion. Difference in average final outcome in terms of MPTA and PPTA with respect to range of motion was studied using unpaired t test at 95% confidence interval. Pearson’s Correlation coefficient was used to study various correlations among data obtained. In this prospective study, 30 patients of fresh Schatzker type V and VI tibial plateau fractures satisfying study criteria were included. The mean age of the patients was observed to be 31.7 years (range 19-50 years) with a male dominance (93%). The most common mode of injury observed in our study was road traffic accident accounting for 24 patients (80%).The other modes were history of pedestrian hit (4 patients, 13.3%) and history of fall from height (2 patients, 6.7%). Out of 30 patients, 10 (33.33%) were classified as having Schatzker type V fracture while the rest 20 (66.67%) were classified as having Schatzker VI tibial plateau fractures. Average time interval between time of admission and definitive surgery was 6.9 days with standard deviation of 3.78 days. This time interval depicted average time required for soft tissue swelling to settle down to allow definitive surgery. Average duration of surgery was 139.7min ±17.6 min with intra-operative blood loss varying between 100-250 ml (162.8 ± 41.97 ml). 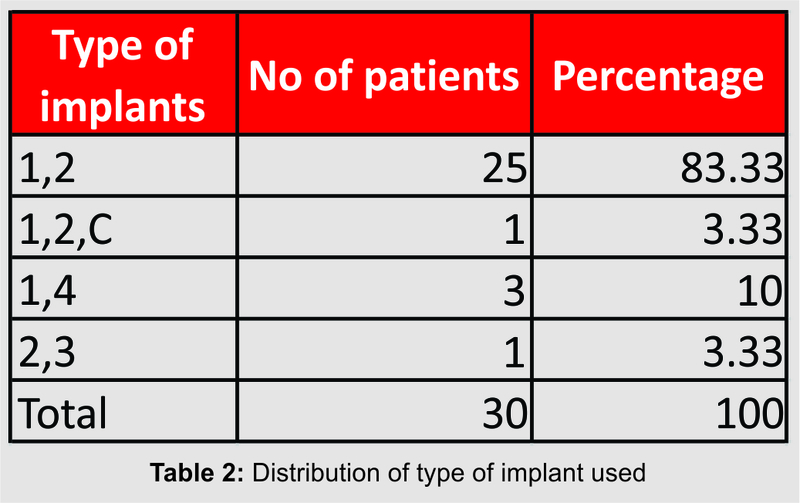 Distribution of implants used is depicted in table no. 1, 2. Mean post operative medial proximal tibial angle was 86.9 while mean postoperative posterior proximal tibial angle was 79.8 which were within anatomical range. Average time of union was 14.37 ± 3.41weeks with 53.3% cases having union time between 12-15 weeks. In our study, superficial infection was encountered in 5 patients (16.67%) which resolved after a course of culture sensitive antibiotic. One patient had deep infection which required repeated debridement and antibiotic coverage. One patient had knee instability which was decided to be dealt at a later stage. Another patient did not show any signs of healing even at 4 weeks which subsequently healed after secondary bone grafting. With respect to functional outcome, at the end of 6 weeks 100˚-120˚ of knee flexion was obtained in all patients while extensor lag was noticed in one patient. 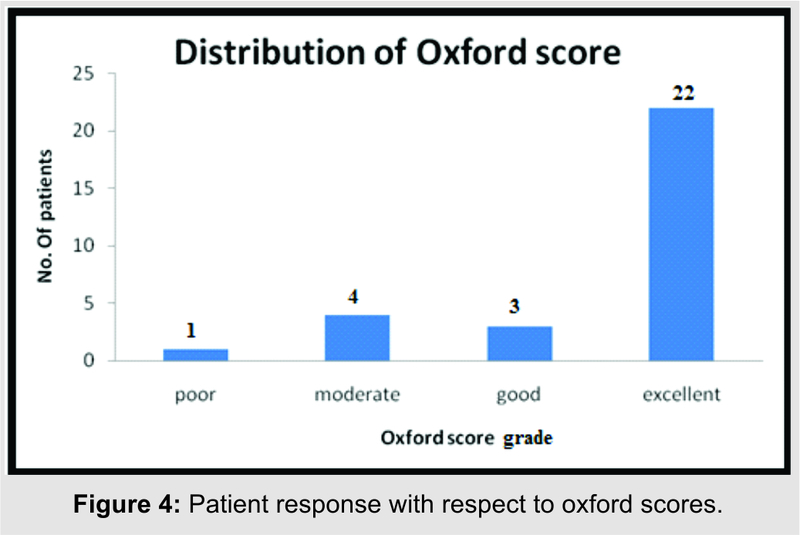 Patient evaluated functional outcome as per oxford knee score questionnaire and its grading is depicted in Figure 3, 4. We studied association between various parameters using Pearson’s correlation coefficient and found no significant statistical association between functional outcome and Schatzker type of fracture, age of patient and oxford score, range of motion and Schatzker type. Whereas, statistically significant correlation was found between range of motion and oxford score (Figure 5), union time and Schatzker type, final radiological outcome and range of motion. The results of complex bicondylar tibial plateau fractures are frequently overshadowed by devastating complications. High energy trauma and associated soft tissue injury increases the chances of complications. Surgery itself acts as a second hit to the soft tissues if not done at appropriate time. Therefore, optimal decision for the management of complex bicondylar tibial plateau fractures (Schatzker type V and VI) is of utmost importance. Through preoperative planning of treatment is necessary in order to attain optimal outcome. Importance of proper imaging is also stressed upon by Bhattacharyya et al. in their study (8). CT scan provides information about spatial orientation of fracture fragments and reveals concealed fracture lines. Chan et al in their study concluded that addition of CT scans increases inter and intraobserver agreement on treatment plan in tibial plateau fractures (9). Barei et al. and Hackl et al. also in their study concluded that CT scan helps in accurate classification of these fractures (10, 11). There are different methods of treatment for these fractures. Literature shows mixed evidences favouring these methods. Each of the surgical methods described have specific advantages and potential complications that must be appreciated by the treating surgeon. In our study we followed a staged protocol, stabilizing the patient using advanced trauma management guidelines then temporary stabilization with external fixator followed by definitive fixation using dual incision dual plate technique when skin condition permitted. In our study time interval between admission and definitive surgery was 1 to 16 days which is comparable with various studies. In a study by Pun et al., this time interval ranged from 12 hours to 21 days while Yao et al., in their study reported time interval of 7-14 days (3, 12). Khatri et al., in their study stated that majority patients of patient’s were operated within 14 days (13). We used dual incision technique in our study .We believe use of dual incisions relieve soft tissue of excessive tension, thereby avoids skin necrosis and hence the cascade of wound complications. It also gives adequate exposure of the fracture anatomy. In our study superficial infection was reported in 16.67 % of patients while deep infection was in 3.33% of patients. In a study by Khatri et al., superficial wound infection was seen in (9.2%) patients while deep infection was seen in 4.6% of patients (13). In a study by Ozkaya et al., superficial infection was seen in 13.63 % while deep infection was seen in 4.54% of patients (14). In 2006, a multicenter, prospective, randomized control trial by Canadian Orthopedic Trauma Society (COTS) reported an overall infection rate of 18% in bicondylar tibial plateau fractures treated with open reduction and internal fixation (2). heal, can minimize the complication rate and in turn improve the patient satisfaction in terms of outcome. Further, a staged protocol is associated with lower rate of complications. Similar observations have been made by Egol et al. and Barei et al. in their study (11, 15). We also analysed the outcome of post operative MPTA and PPTA on the functional satisfaction of the patient .We observed that if MPTA and PPTA are within the permissible range, it gets directly reflected in terms of improved patient satisfaction as observed by oxford scores. Quantifying patient’s functional satisfaction, in our study 73.33% patients had oxford score 40 – 49 graded as excellent outcome. A study by Prasad et al. has observed oxford score of 40-49 in 40% of their patients treated with dual incision and dual plate (16). 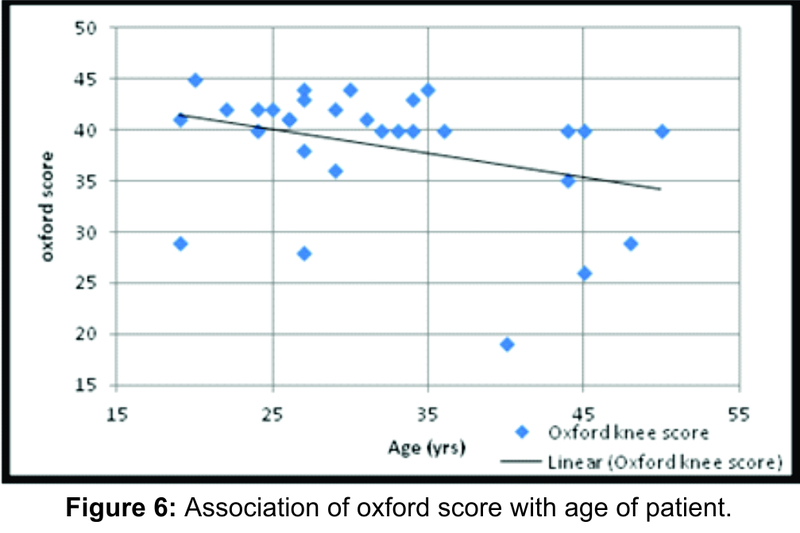 We observed that age of patients and oxford score are negatively correlated (r= -1.91) i.e. oxford score decreases with increase in age. However the correlation was not statistically significant (Figure 6). operative technique, type of fracture and post operative physiotherapy. These problems can be addressed effectively by a proper preoperative planning. An aggressive but vigilant patient tailored physiotherapy protocol, improves the final functional outcome. In our study we did step by step intervention to optimise our treatment towards the optimum final outcome. We believe that planning a ladder fashion staged procedure in complex tibial plateau fracture treated with dual plate technique with dual incisions provides good results. Finally, we do recognise certain short comings in our study such as less number of cases which may mask the real significance of results. In spite of these limitations, we believe that our study provides legitimate supporting evidence regarding management of complex bicondylar tibial plateau fractures validated by patient based functional outcome evaluation using Oxford knee score. Soft tissues dictate the outcome in complex tibial plateau fractures .Staged management allows appropriate time for soft tissue healing. Use of dual plating using dual incisions achieves adequate fixation with minimal soft tissue compromise. Therefore, it allows early aggressive knee mobilization that in turn enhances the process of union, avoids knee stiffness and goes a long way in ensuring optimal functional recovery and patient satisfaction. 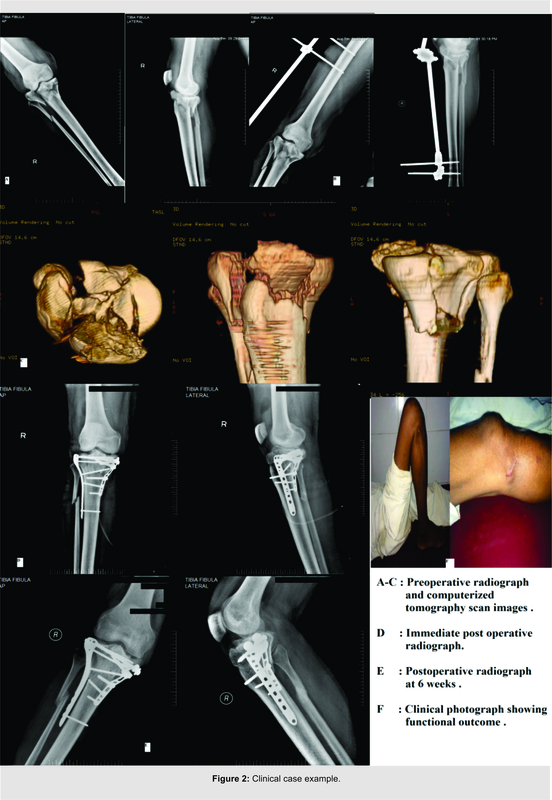 Hence in our opinion staged management with definitive fixation using dual incision, dual plating technique is an excellent method of treatment of complex bicondylar tibial plateau (Schatzker type V and type VI) fractures in judiciously selected cases. 1. J.R. L, D.J. J, G.J H. Tibial plateau fractures. In: Scott WN, Insall JN, editors. Insall & Scott Surgery of the Knee. 5 ed: Churchill Livingstone; 2012. p. 773-85. 2. Mckee MD PS, Stephen DJ. The Canadian Orthopedic Trauma Society. Open reduction and internal fixation compared with circular fixator application for bicondylar tibial plateau fractures. Results of a multicenter, prospective, randomized clinical trial. J Bone Joint Surg Am. 2006;88(12):2613-23. 3. Yao Y, Lv H, Zan J, Li J, Zhu N, Jing J. Functional outcomes of bicondylar tibial plateau fractures treated with dual buttress plates and risk factors: a case series. Injury. 2014;45(12):1980-4. 4. Barei DP, Nork SE, Mills WJ, Coles CP, Henley MB, Benirschke SK. Functional outcomes of severe bicondylar tibial plateau fractures treated with dual incisions and medial and lateral plates. J Bone Joint Surg Am. 2006;88(8):1713-21. 5. Zura RD, Browne JA, Black MD, Olson SA. Current management of high-energy tibial plateau fractures. Current Orthopaedics. 2007;21(3):229-35. 6. Burdin G. Arthroscopic management of tibial plateau fractures: surgical technique. Orthop Traumatol Surg Res. 2013;99(1 Suppl):S208-18. 7. Dall’oca C, Maluta T, Lavini F, Bondi M, Micheloni GM, Bartolozzi P. Tibial plateau fractures: compared outcomes between ARIF and ORIF. Strategies Trauma Limb Reconstr. 2012;7(3):163-75. 8. Bhattacharyya T, McCarty LP, 3rd, Harris MB, Morrison SM, Wixted JJ, Vrahas MS, et al. The posterior shearing tibial plateau fracture: treatment and results via a posterior approach. J Orthop Trauma. 2005;19(5):305-10. 9. Chan PS, Klimkiewicz JJ, Luchetti WT, Esterhai JL, Kneeland JB, Dalinka MK, et al. Impact of CT scan on treatment plan and fracture classification of tibial plateau fractures. J Orthop Trauma. 1997;11(7):484-9. 10. Hackl W, Riedl J, Reichkendler M, Benedetto KP, Freund M, Bale R. [Preoperative computerized tomography diagnosis of fractures of the tibial plateau]. Unfallchirurg. 2001;104(6):519-23. 11. Barei DP, Nork SE, Mills WJ, Henley MB, Benirschke SK. Complications associated with internal fixation of high-energy bicondylar tibial plateau fractures utilizing a two-incision technique. J Orthop Trauma. 2004;18(10):649-57. 12. Pun TB, Krishnamoorthy VP, Poonnoose PM, Oommen AT, Korula RJ. Outcome of Schatzker type V and VI tibial plateau fractures. Indian J Orthop. 2014;48(1):35-41. 13. Khatri K, Lakhotia D, Sharma V, Kiran Kumar GN, Sharma G, Farooque K. Functional Evaluation in High Energy (Schatzker Type V and Type VI) Tibial Plateau Fractures Treated by Open Reduction and Internal Fixation. International Scholarly Research Notices. 2014;2014:8. 14. Ozkaya U, Parmaksizoglu AS. Dual locked plating of unstable bicondylar tibial plateau fractures. Injury. 2015;46 Suppl 2:S9-13. 15. Egol KA, Su E, Tejwani NC, Sims SH, Kummer FJ, Koval KJ. Treatment of complex tibial plateau fractures using the less invasive stabilization system plate: clinical experience and a laboratory comparison with double plating. J Trauma. 2004;57(2):340-6. 16. Prasad GT, Kumar TS, Kumar RK, Murthy GK, Sundaram N. Functional outcome of Schatzker type V and VI tibial plateau fractures treated with dual plates. Indian J Orthop. 2013;47(2):188-94. 17. 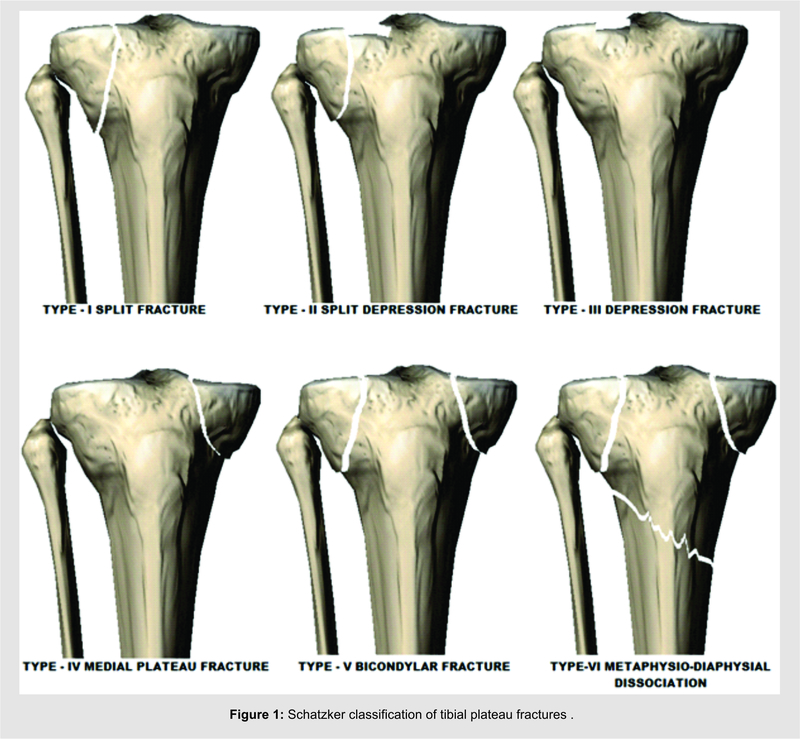 Schatzker J, McBroom R, Bruce D. The tibial plateau fracture. The Toronto experience 1968–1975. Clin Orthop Relat Res. 1979(138):94-104. How to Cite this article: Kulkarni SG, Jain A, Shah PB, Negandi S, Kulkarni VS, Sawarkar A. A prospective study to evaluate functional outcome of staged management of complex bicondylar tibial plateau (Schatzker type V and VI) fractures treated using dual plates as internal fixation. Journal of Trauma and Orthopaedic Surgery.Jan – March 2017;12(1):16-22.